There’s a new event at the world’s largest multi-sport fitness weekend and each and every one of the 185,000 people who attended the Arnold Sports Festival participated – whether they wanted to or not. This new event is called Navigating the Arnold and it requires a wide range of skills and a love of adventure. For example, you need to know how to make your way through a throng of thousands of people, with your head on a swivel to catch a glimpse of the famous bodybuilders, wrestlers, powerlifters and gymnasts walking by. Quickness is a necessity, as you often need to duck and dart through small openings before the hole closes up – and shoot photos on your smart phone as you make your way from one venue to the next of the famous people you see. You never know when a bevy of 30 bikini-clad, perfectly spray-tanned beauties will walk by in a long line on their way to a completion venue. Some of the savvier Arnold attendees knew where to go to see – and get their photo taken with – Olympic gold medalist Kurt Angle (wrestling), bodybuilding superstar Ronnie Coleman and Cincinnati Reds Hall of Famer Johnny Bench. They were at the Arnold and the Greater Columbus Convention Center on Saturday to be inducted into the International Sports Hall of Fame. Come to think of it, Arnold – the man and the event – has an impact on the lives of everyone in Central Ohio. Ricart was the only car dealer in the Expo. It dates back to Arnold’s long friendship and business relationship with Rhett “We’re Dealin” Ricart. 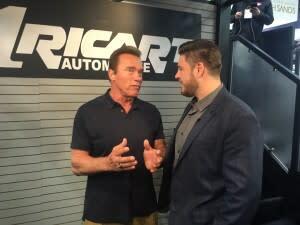 Arnold suggested to Rhett that Ricart get a booth at the Expo more than 20 years ago, and, when Arnold makes a suggestion, people tend to listen. “It’s not a bad thing to build our brand here with (185,000) people and be associated with Arnold,” said Hern, Ricart’s advertising director. The economic impact on the local economy from all these Arnold people is more than $51 million, according to Experience Columbus. Proof of this could be seen in the convention center, as the line at the ATM machine stretched for 30 or more people. *You must get your photo taken in front of the Arnold statue outside the convention center. You can flex, if you dare, or better, yet, pose with the Arnold statue you just won – it’s a tradition. *When you need to get from one end of the convention center to the other, it’s often better to go outside and around rather than through. But not during the Pump and Run 5K. *You should keep an eye out for cool and fun T-shirts. Here’s two we spotted: Team Cupcakes Powerlifting and My Mom’s Stronger Than Your Dad. *The shuttle buses – use them. *Have a plan for meals. The food court is packed at meal times, and so is the North Market and other Short North and Arena District restaurants. “How long is the wait?” a party of four asked as they walked into Melt, which is about half a mile north of the convention center. “Forty-five minutes,” the hostess said. And, get this, the people in the party of four didn’t even seem annoyed or impatient. They must be Arnold regulars and know that 45 minutes isn’t a long wait at a Short North hot spot during the busy weekend. Terry Smith is an Arnold regular, travelling from Michigan every year, and knows his way around the convention center. “I’m training for a physique contest in Michigan next month,” he said, adding he hopes to work his way up through the ranks – and rankings – and compete in the 2017 Arnold. Smith couldn’t resist taking the challenge at the Naval Special Warfare booth. Those brave – and strong enough – had the opportunity to put on a 40-pound rucksack and see how many pull ups they could do. Smith managed a very respectable nine. “That’s a bit of weight,” he said of the rucksack, adding that without it, he can do 40 or more pull ups. U.S. Navy Seal David Mitchell was in charge of the booth. He prefers running with the 40-pound rucksack to doing pull ups, and can hammer out 16 miles at a fast pace. Why is Naval Special Warfare at the Arnold? 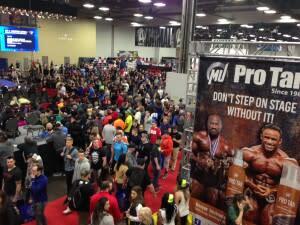 The pull up competition helped attract thousands to the Naval Special Warfare booth. “Everyone has an ego and we like to challenge that,” Mitchell said. More than 500 attendees filled out applications, which means many of the Navy’s heroes of tomorrow will have gotten their start the past few days at the Arnold. For those not in the know about the Arnold, there were plenty of Volunteer Information Registration Specialist spread out downtown and beyond, courtesy of Experience Columbus. First-time attendees have a lot of questions. Such as where to eat, where to get their hair cut and makeup applied, and where to find a full-service gym for one last workout before their competition. And, for some unknown reason, a lot of competitors like to celebrate and break training with a post-competition plate of chicken wings – and want to know where to find the best wings in Columbus. “It’s a lot of fun and you meet so many nice people,” said Joyce Clark, who’s been a Volunteer Information Registration Specialist for four Arnolds.